There are many treatments available for this disease. These include physical therapy, occupational therapy, medication therapy, sympathetic blocks, spinal cord stimulator, intrathecal pumps, and most recently Ketamine infusion therapy. Additionally, it is important to educate the patient on diet, nutrition, lifestyle change, stress reduction (with meditation, prayer, yoga, etc.) to facilitate a coordinated approach of mind and body to the treatment. Additionally, familial support is extremely helpful and family members should be brought in to the treatment plan both in terms of comprehension and understanding of the symptoms as well as ways to assist the patient. 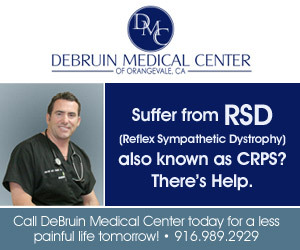 Each of the aforementioned treatment entities has a place in RSD/CRPS therapy and the benefits and risks of each one should be weighed by the clinician on a case by case basis. Certainly, however, continued movement and mobilization of affected limbs is imperative to whatever degree the patient can tolerate. In our office we treat RSD/CRPS with s a low dose subanesthetic Ketamine infusion ranging between 10-60mg per hour for four hours over several treatment days. We follow this protocol with a follow up booster infusion protocol. Incorporated in our Ketamine treatment plan for each patient is a comprehensive approach including physical therapy, medication therapy, diet and nutrition as an overall attempt at a healthier lifestyle. Prior to treatment, you will need blood work and clearance from a Cardiologist and Psychologist or Psychiatrist. If interested in our Ketamine treatment please contact the office to inquire about any question you may have along with information concerning hotel stay and car rental which we have negotiated deep discounted rates specifically for DeBruin Medical Center patients to help control and lessen the cost of travel.